If you want to share any confidential file online, it is better to encrypt it before sending. Encryption will protect your files from unauthorized access. There are many software available which can encrypt your files. If you do not want to install any desktop software for this, you can use online tools for this. 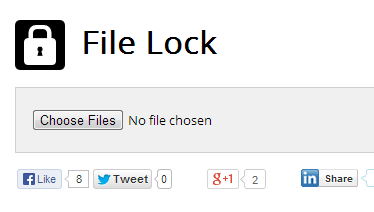 File Lock is a nice web application, that lets users encrypt files direct from browser. File Lock is a nice encryption service that runs purely on HTML5. You do not need to install any kind of browser plugin or add-on for using this service. File Lock claims that it users AES-256 encryption to encrypt your files. The longer password you will choose, better it will perform. How to encrypt files with File Lock. 1. Visit File Lock. You will see a file chooser just below the logo. 2. Select files from here. If you want to select multiple files, you can select by holding SHIFT or CTRL. 3. Then enter the password to encrypt the file. 4. After entering the password, click on encrypt button. In few seconds, it will encrypt the file. After encryption, it will add .enc extension at the end of the file to show that files are encrypted. 5. Recipient need to take the file and then decrypt on this website in order to see the file. If you forgot the password, there is no way recover password of decrypt the file without the password. It uses two ways in browser to perform encryption. One is HTML5’s FileReader way and other is Adobe Flash Player way. If you have browser that does not support any of the two things, you will not be able to use this application to encrypt your file. This is really a simple but nice application to protect your files. As it works on Browser, it has file size limitations. I recommend to check this application with less important data. Few users also pointed out that File Lock lacks contact info which makes it suspicious. Use File Lock and share your views with us via comments.